Saturday, July 23rd was the moment all the Nomads warriors had been waiting for! I, as a spectator had also been waiting for that moment when everything would be concluded. 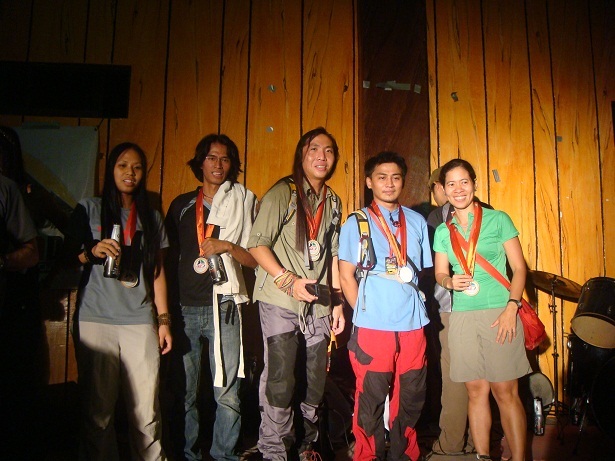 For the information of those who are not aware yet, Sir Romy Ballesteros (aka Ka Romy) of The Nomads Outdoor Adventure Club Inc. organized a race for mountaineers that covered the period from February to June of this year (2011). The goal for each warrior was to accumulate 30,000 fasl (feet above sea level) of climbs covering mountains in the three island groups of the country. The goal was made in line with the Nomad’s tenet Never Give Up! 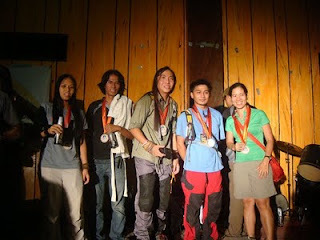 We believe that more Filipinos can actually face the challenge of climbing Mt Everest (which is about 30,000 fasl). The competition was participated in by more than a hundred mighty men and women in both the first and the second waves of the competition. And these warriors climbed a cumulative elevation of 11, 461, 192 fasl which is comparable to climbing Mt Everest 356 times. But as every record was set, many challenges were one by one opened along the way. Among those were, 50k fasl, 100k fasl, 20/7 (20 peaks in 7 days) and 25/7. These new challenges were done in pursuit of the answer to the Nomadic question ‘When was the last time you did something for the first time?’ And here are the names (Facebook names mostly) of those who dared to answer that question and establish the Nomads Peak. 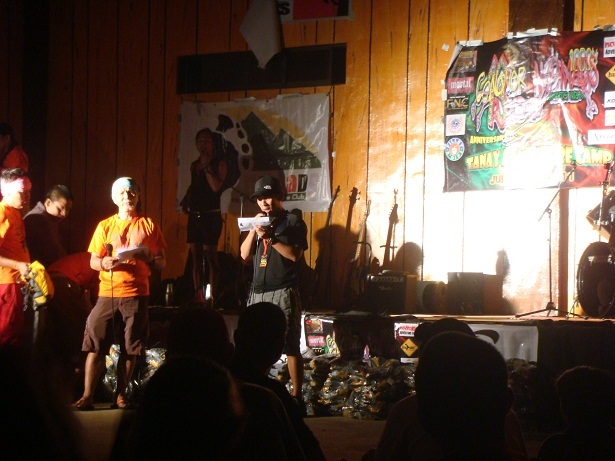 That night was not only the Nomads Awards Night but also the 13th Anniversary of Team Conquer. 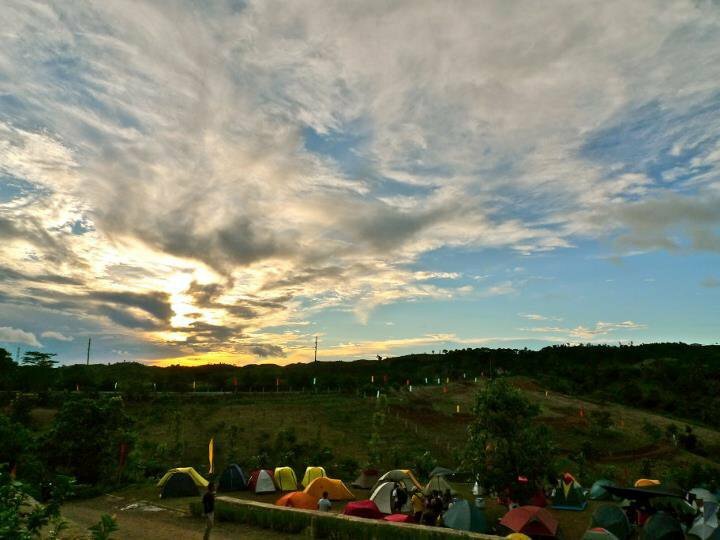 And we were blessed with a starry sky and a star-studded event in Tanay Adventure Camp! The masters of ceremonies were the couple Jonnel and Jean Lacaba, Jon Alano and Jannie Negrido. Many big names in the Facebook age of outdoorsmanship and adventurism were present. And just like big bright stars, everybody gravitated towards and revolved around them! Everyone wanted to get as close as possible to them. And I had the rarest chance of presenting awards next to the man of the night himself Sir Romy Ballesteros. Sir Romy is a genial, light-hearted visionary who has an unquenchable thirst for adventure and a passion to share adventurism to everybody else whichever part of the globe he is at. 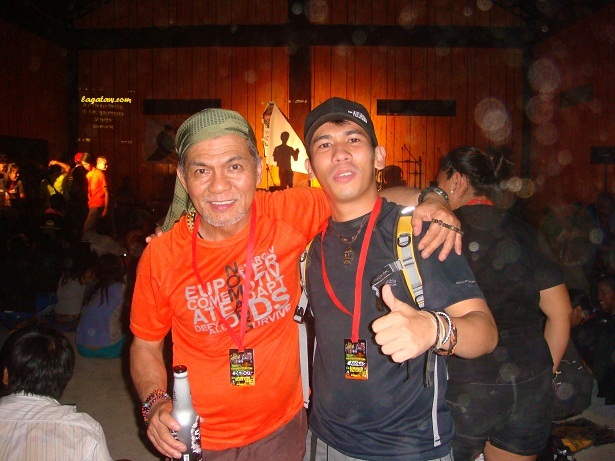 He has organized as well as participated in countless adventure races in the country and abroad. Most of us met him only during that night! But he had already been a part of our journeys even before his path and ours crossed. Many regard him as a father and a guide. And many derive inspiration from his boldness, spirit and good example. I also had a chance to strike a conversation with Jessie Tan, the man behind Conquer Outdoor Equipment. This man is the epitome of humility and charisma! He might not know you but when he talks to you, he’ll let you feel like you’ve been together in more than ten booze-ups! This man who admits that three fourths of the adventurer in him was molded and fashioned by Team Nomads has also participated in and won many adventure races in the country. That night, Jessie and Kat Tan were given the Nomads Never Give Up Award for their unwavering support for many outreach and sports events and for their dedication to provide mountaineers and other sports enthusiasts with quality products. Although I was not a part of the competition I felt like I was one of the warriors. Many of the achievers and awardees are also good friends of mine. I finally got to meet in person Jonie Abesamis, Kat Ocol, Jay Z Jorge, Levy (El Bundokero) Umandap, and Sadeck Miguel whom I only corresponded with through SMS and online. I was also pleased to once again see Cheryl Bihag, Jannie Negrido, Koi Grey, Melo Sanchez, Dennis Hisanan, Ken Ybarola, The Sabiterz Tribe and the newlyweds Eduardo and Sha Bedural who got married on that same day! And how could I forget?! 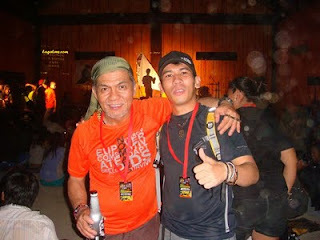 My very good friend Sir Emil Eslana was there too (although he was a little late that night)! I would also like to thank Sir Akiru Escasinas for giving me company when I wanted not to be seen! He was there alone and Lagataw doesn't like big crowds! On the same night, an award was given to Samahan ng mga Reponsableng Mamumundok sa Pilipinas (SRMP) for the event Freedom Walk. Right after El Bundokero of SRMP received the ward, an award was also given to Alliance of Filipino Mountaineers (FIMO) for Freedom Climb. I honestly don’t want to make an issue of the ‘boo’ that I heard from one corner of the hall while the acting president of FIMO was giving his acceptance speech but I think it’s high time everybody healed and moved on! It’s been more than a month after all! If you want to make a change, ACT and do something just like SRMP! It was a relief to see El Bundokero and FIMO’s acting president shake each other’s hands after they accepted the awards. I wish I had seen the same scene when Melo Sanchez and Sadeck Miguel set things straight and clear. Both were mere victims of malicious talks, which neither dipped his finger into. And that’s what Sadeck told me when I got the chance to talk to him. ‘Ayus na kami ni Melo. Nadala lang kami sa usap-usapan’. I got similar words from Melo. They don’t know each other personally. They can’t hate each other. And I wrote this note not to stress the issues but to congratulate Ka Romy! Indeed, it was a night of celebration and healing that Ka Romy made! There, people came together and patted each other’s shoulders like rational individuals! They set aside their differences and saw each other’s value as a person! So watch out for more of Nomads Outdoor Adventure! We started the expedition at Christian Zamora's Campsite in Pala-Pala, Dasmariñas, Cavite on the night of July 1st. We downed two bottles of rum and headed for Daniel Buyco's place in Bayan (Dasma) at around 1 am (July 2). Yep, not so much of a plan! The climb was supposed to be that way: guided by trust and luck! All three of us had climbed the Kinabuhayan side of Cristobal anyway! But what we did is not recommended for beginners. We didn't care where we would exit. Nobody researched about it. 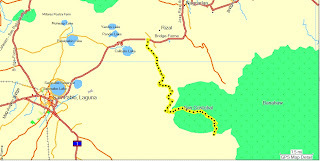 We just knew that there were two exit points: Nagcarlan and another one which we had not heard of. It turned out we were going to exit at that less popular exit point (Rizal, Laguna). 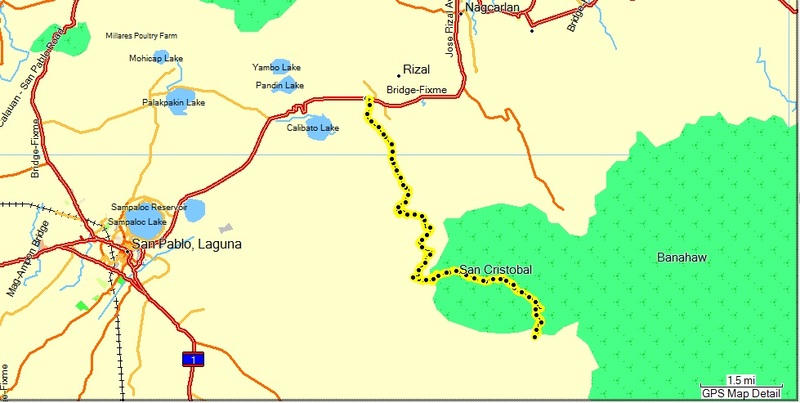 We (Daniel, Kevin and I) commenced the trek at Kinabuhayan at 12:30 pm! We reached the Montelibanos' place at 1 pm. We ate our (Andok's) Dokito Fritos and resumed trek around 1:40pm. We reached the crater lake around 3pm. It started to rain when I started filming. Should have asked permission from the spirits! We reached the summit at around 3:30 pm. The view would have been breath-taking without the clouds that obscured the seven lakes. The steep descent is not friendly to toenails so cut them before the trek! From the summit down to this point (Panuyuan @ 3:50pm), there is a clear slippery trail. I'm sorry, when I said kaliwa I was referring to my left. When you're trekking, where I'm standing should be on your right going up. When you reach the 'Sagingan' part, the trail becomes difficult to locate and follow. After the Sagingan, it gets even trickier when the talahib gets really tall as they cover the trail! Then when you've gone out the national park, you'll encounter isolated vegetable gardens that somehow hide the trail. This is the point where you're almost outside the national park area. The trail will at times be hidden on the sides of isolated vegetable gardens. The hill which I'm referring to here is probably referred to as Ermita by the locals. The trail will be very clear at this point. The black volcanic trail will lead you through some houses and will be cemented even before reaching Brgy. Tala. I consumed only one bottle of Cobra, 250ml of water, my packed lunch, a bar of Kitkat, and shared with my companions 2 packs of pineapple tidbits and the hopia. I replaced my lost electrolytes with 500ml of Pocari Sweat after the trek. I feel energized when I don't drink a lot water on the trail. But it is always good to bring more water than you expect to consume. You never know when you'll have to call for an emergency camp. 1.5L of water, two bottles of Cobra and another bottle for my Hydrite. 1950hrs: ETA Highway (Rizal, Laguna). Change clothes at another Brgy Hall. Take the jeepney bound for San Pablo. * If you’re coming from Manila, just head straight to San Pablo City. Get off at the bus stop (near the medical center) and get a tricycle (P40/trip) to the market (tell the driver you’ll take the jeepney to Kinabuhayan). We were able to avoid registration fees because of the unlikely times that we showed up at the entry and exit points. Many thanks to my companions Daniel Buyco and Kevin Jauod for their trust, speed and strength. Special thanks to Dennis Hisanan for a very helpful tip. I phoned him at the Saddle Campsite and ask for tips on the way down. That was the first time I heard of Brgy Tala in Rizal, Laguna.